How did we manage without… computers? I know that computers have been around for years but when I started my business in 1992 they were still too expensive to be common in the home or start up business. Shortly after launching I was offered an opportunity to tender for a significant project, I needed to find a way to present my proposal professionally. Buying a computer wasn’t an option so I contacted a secretarial bureau, the price they quoted was quite high and the turnaround times offered didn’t work for my deadlines. I bought a portable memory typewriter! Do you remember the memory typewriter? Do you remember those? Like the traditional typewriter we had to load a ribbon, feed a sheet of paper through the rollers and then start typing. We would read the words on the paper as we typed. 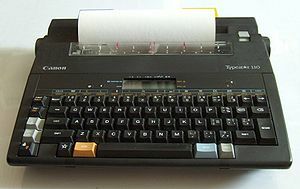 The beauty of the memory typewriter was that it would retain a sentence or two of the text so some mistakes could be corrected. However producing a perfect document was laborious and time consuming. If you wanted more than one copy you had to use carbon paper (remember that?) or find somewhere to photocopy. It was a major step forwards when my husband’s employers allowed staff to take home their old desktops when the company upgraded to new machines. In effect what he brought home was a word processor operating on Word Perfect. At least we could play about with layout and change the copy easily. We could even add a clipart image if there was something suitable in the library of 16 images! Now I know that the Apple aficionados will say that they were there first but the advent of Windows 1995 really transformed the way most of us use our computers. Starting up and shutting down became faster, working between programmes became easier and the range of media our computers could deal with became wider. The things we now take for granted were beginning to make an appearance, Microsoft Office, Emails, the Internet and computer gaming to name just a few. The proposals that I was writing in the mid 90s could be edited, formatted and shared with colleagues working in their own offices miles away. We had come a long way in a very short period of time. And the developments continue, now I can carry a computer in my handbag and share work using a wifi connection from wherever it suits me. If I prefer I can work on my smartphone or tablet. I wonder what will come next. This entry was posted in Business development and tagged Apple, Hardware, Microsoft Office, Microsoft Windows, Personal computer, Typewriter, Word processor, WordPerfect by glendashawley. Bookmark the permalink. I’d forgotten about those! What a difference email has made. We can keep in touch with our customers wherever we are.